(Cape May, N.J.) – As part of their commitment to sourcing locally, Cape May Brewing Company is pleased to announce a modern first in the state of New Jersey: a beer made with all New Jersey-cultivated ingredients. Releasing from their Tasting Room at 1288 Hornet Road in Cape May on November 10th, Three Plows IPA will contain hops from Laughing Hops Farms in Pennington, malt from Rabbit Hill Farms in Shiloh, and yeast from East Coast Yeast in Hillsborough. Krill agrees. “We really wanted to utilize all the products we could get our hands on,” he says. “It really is a great agricultural state,” said Valm. The name Three Plows is inspired by the New Jersey State Seal. Prominent on the seal is a blue shield with three plows emblazoned, representing not only New Jersey’s reputation as an agricultural powerhouse, but also its precedence in the Order of Statehood: New Jersey was the third state, just behind Delaware and Pennsylvania. The idea was hatched during the brewers’ trip to Rabbit Hill Farms over the summer. Blair Bakker of Rabbit Hill Farms is a homebrewer, and the idea was borne from his desire to brew a beer using ingredients he’d grown himself. Growing barley was new to the farm, but not beyond their expertise. He and sister Hillary Barile learned to malt the grain, and are now using a system known as floor malting — one of the few large-scale operations in the country using this primarily-antiquated process. The original concept for Three Plows was to make this a year-round offering. However, due to the lack of large-scale hops production in the state, this plan was soon realized to be less than feasible. Locating enough hops in the state to produce this beer at all was proving to be a trial, but Barile was able to put CMBC in contact with Michael Kane of Laughing Hops Farms. This is only the second year of production at Laughing Hops; it takes a few growing cycles to get a crop the size needed by CMBC. Kane’s first year yielded only a few pounds, but this year he was able to produce and pelletize enough to supply the brewery with the necessary amount for this brew. The brewery had long had a successful relationship with a New Jersey lab for yeast. East Coast Yeast, headed by Al Buck, supplied CMBC with the various yeasts used in their highly-acclaimed Barrel Aged Series — portions of this series have been barrel-aging for almost three years, so the relationship was already brewing. The beer was put into production on October 20th with a brew day attended by representatives from the two farms and the laboratory, members of the press, and New Jersey Assistant Secretary of Agriculture Al Murray. Three Plows IPA has a smooth malt sweetness, a firm and earthy bitterness, and a complimentary fruit note from the yeast. 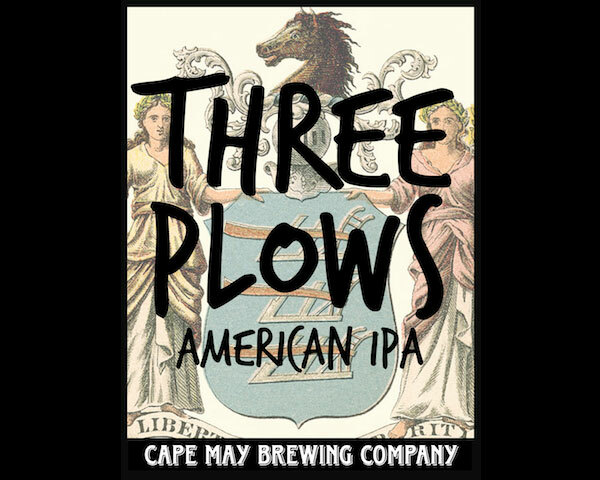 Three Plows releases Thursday, November 10th from the Cape May Brewing Company Tasting Room at 1288 Hornet Road in Cape May, with the first of their series of Fireside Chats at 5 pm. Visitors will have the chance to cozy about CMBC’s firepit with Krill and Valm as they discuss the creation of this unique brew: from the decision to brew this offering, to the selection of ingredients, to the final product. Following the release in the Tasting Room, Three Plows will be available at better bars and restaurants region-wide. For more information, or for tastings and tours, visit capemaybrewery.com or call (609) 849-9933. About Cape May Brewing Company: Once upon a time, twenty-something Ryan Krill earned a six-figure salary working in finance and real estate development in Manhattan, while his college roommate, Chris Henke, designed satellites. During a summer weekend at the Jersey shore, they brewed a batch of beer with Ryan’s dad that wasn’t half bad. “Should we open a brewery?” Ryan asked, only half-serious. But, by the following year, the three guys had secured a space at Cape May Airport where they concocted a makeshift brew system and honed their beer-making skills. In 2011, they started with one client. Today, there are hundreds of accounts in Jersey and Pennsylvania proudly serving the guys’ award-winning recipes. And CMBC’s fearless leaders have never looked back. Jester King Introduces 2016 Estival Dichotomous Have Jolly Pumpkin / Monkish Collab, Phantom Carriage & Kern River Shipped to You!